The Skills Tree C++ Plugin offers a fast and easy way to incorporate a Skills Tree system in your project. This documentation will cover all the available features and How-Tos at the time of writing. 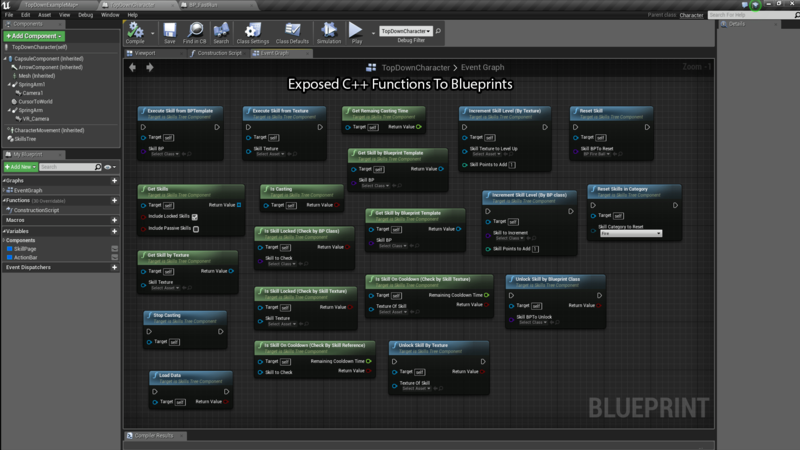 Even though this is a C++ plugin you can leverage every one of its features in Blueprints. In case you’re a C++ programmer, the source code is fully documented so you can extend its functionality to match your needs. Once complete this step, the plugin will have successfully installed into your project. Once you have created your Skill’s Blueprint, you can temper with every option available. Keep in mind that if you try to assign invalid values (for example negative Damage) the plugin will reset the assigned values into acceptable ones. In case the Current Level of the skill equals to 0, the plugin will automatically mark this skill as locked inside the SkillUnlockComponent. 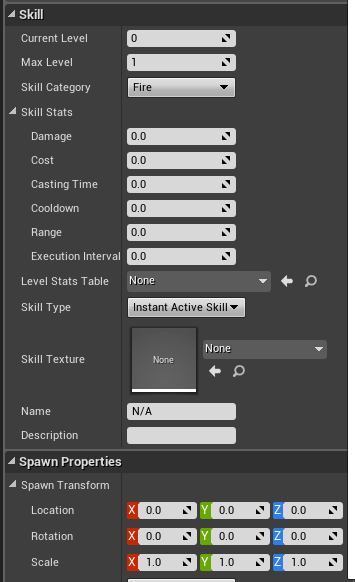 The Max Level of the skill will be automatically generated by the plugin, based on the assigned Level Stats Table. 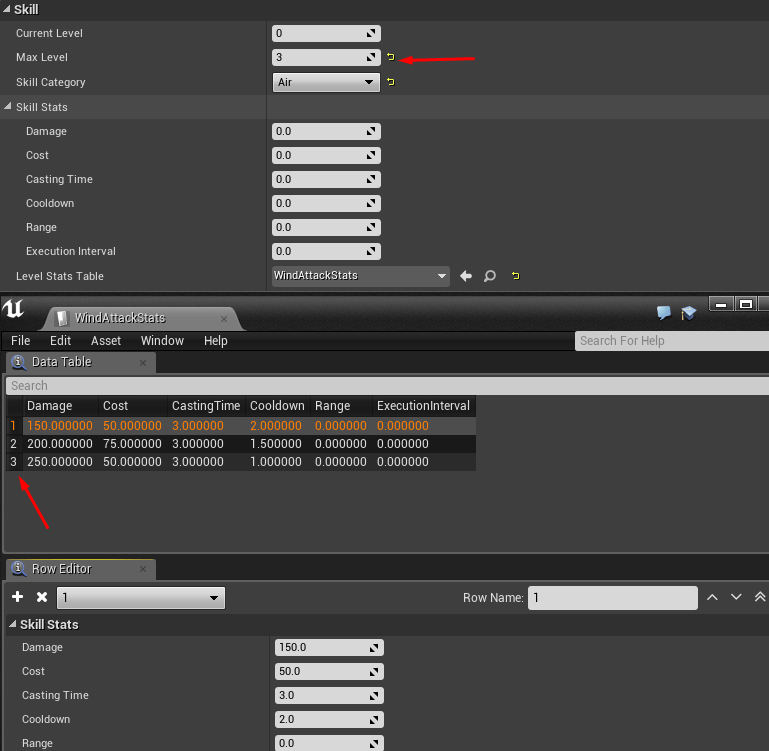 Keep in mind that the Skills Tree component will automatically call these functions. 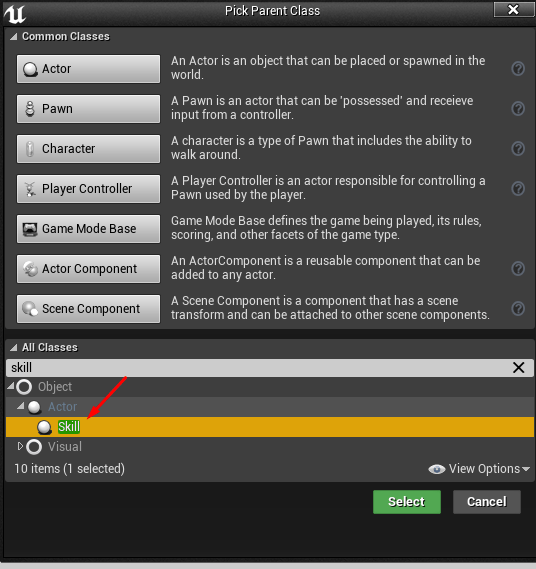 The CastingFinished function will get executed if the skill is of casting type and the ExecuteSkill will fire when the player executes the skill. Then, in the details tab, the only thing you have to specify is the Available Level Up Points value and the available skills (SkillsArray property) that this component will have. Keep in mind that you have to add all the skills that you want your character to have eventually. Each element in the SkillsArray is a Blueprint class based on the Skill class that we have demonstrated in Skill class overview. Once you have provided some Skills and a number of Available Level Up Points in your character’s Skills Tree Component, the only thing left is to tell the component that wish you execute or level up a skill. The plugin will handle all the logic for you and will perform the necessary actions, if possible. 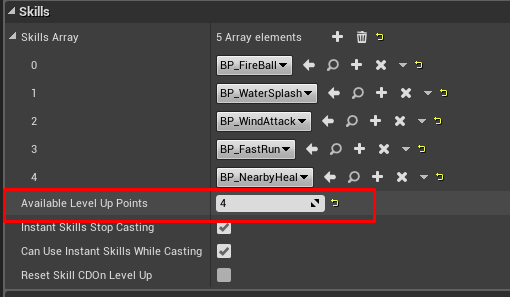 This means that if the player attempts to level up a skill that it’s currently unavailable to him (based on your assigned properties in the SkillUnlockComponent) the skill won’t level up. 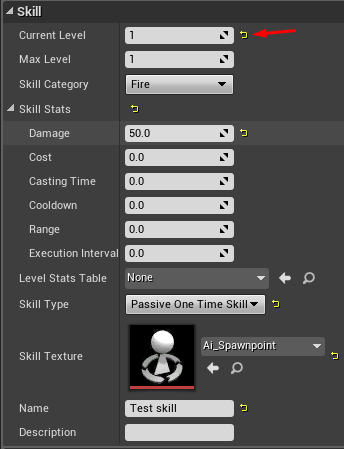 Moreover, the SkillsTree component will perform necessary checks so the player can execute only the skills that he has learned so far. Its Texture, using the node “Execute Skill from Texture”. 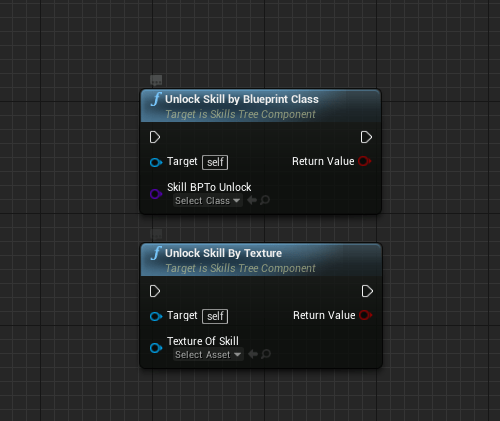 The Skills Tree component will execute the skill with the matching texture (used for UMG-binding mostly). The skill is spawned in the provided relative transform. 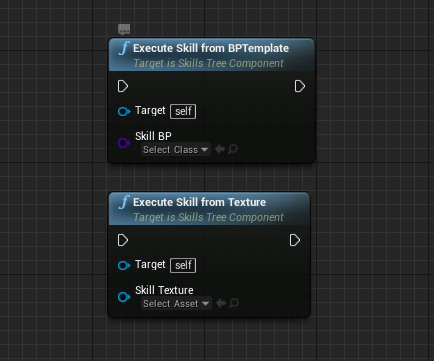 By default this transform is the player’s transform, if you wish to change that provide your logic inside the ExecuteSkill function inside your Blueprint. The function ExecuteSkill is called, from the Skill that has been executed. In order to create an action bar, you need a couple widgets and some Blueprint logic to match your UI needs. 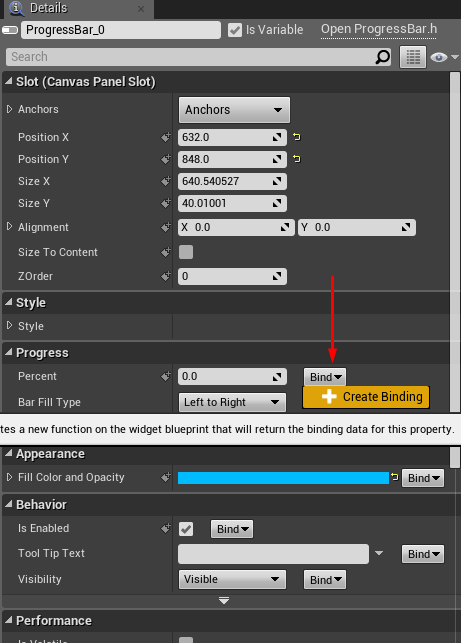 This documentation will provide a way to create some sample widgets, however you will find yourself changing this approach in order to match your game’s needs. 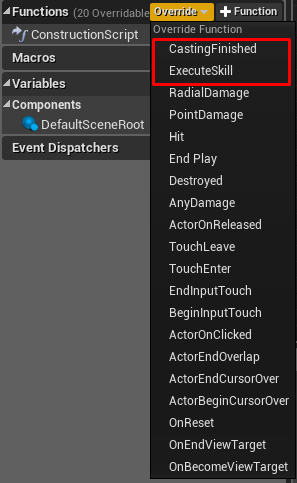 We’re going to call this function from the widget that will contain all the ExecuteSkillButton widgets in a moment. The skill will be unlocked only if the unlock criteria that you have assigned in the UnlockSkillComponent are met. If the unlock fails, the plugin will display a warning in your Output log, stating the problem. If the skill unlocks successfully, the plugin will increase its level by 1. In order to enable a skill by default, change its CurrentLevel to a value of 1 and assign the stats you want your skill to have. If this skill is a passive one, the plugin will spawn that skill when the player starts the game. Make sure that each line has an integer as a Row Name. The Row Name corresponds to the Skill Level. The SkillsTree component will not attemp to unlock the skill in case its Available Level up Points are equal (or lower) than 0. 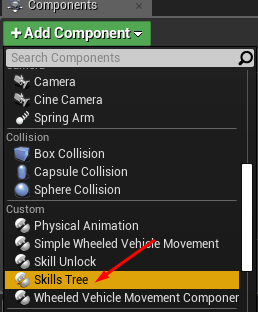 Note that the SkillsTree component contains a On Skill Level up event that will automatically fire when you have incremented a skill level. If the skill cannot be leveled up any further, a warning will appear in your Output log. Don’t forget to add the comma right after the parenthesis and do not add your category after the SC_LASTCATEGORY. 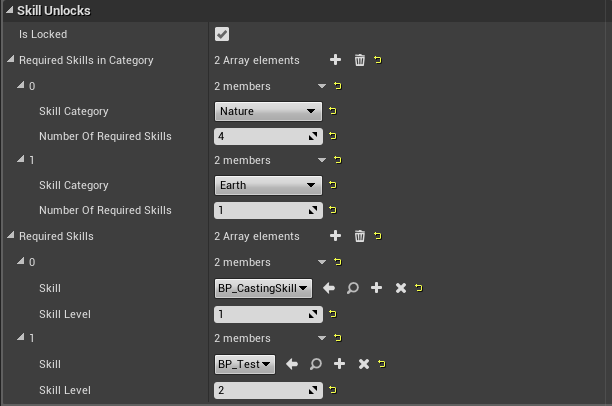 The plugin supports up to 256 different skill categories. 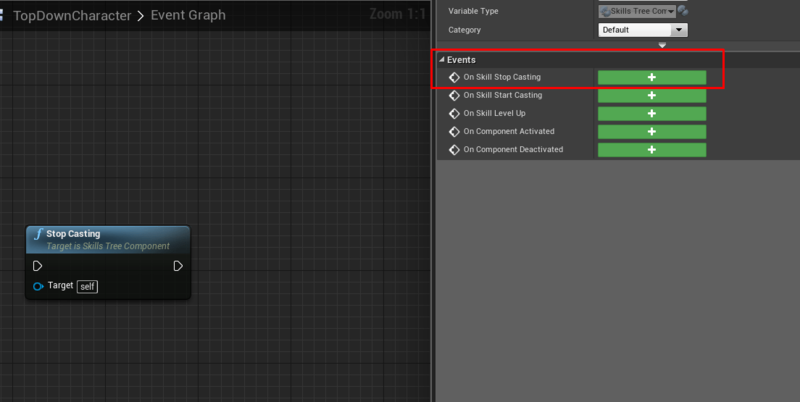 Please note that you can assign your own logic to On Skill Stop Casting event, located in the Skills Tree component. This event will execute automatically after the Stop casting takes place.